001. POLAR EXPLORATION. 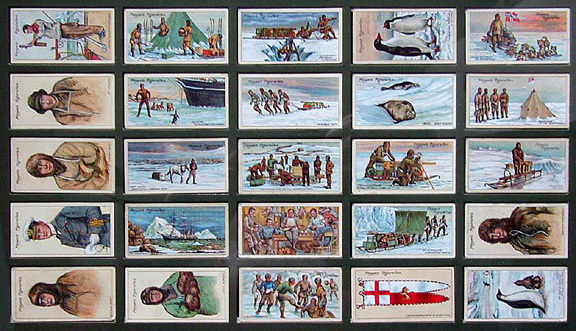 Issued in a second series of 25 by John Player & Sons in its "Polar Exploration" series (Date? Post 1912). Size: 2.62" x 1.4". Recto: Chromolithographic images from the south polar regions and Scott's 'Terra Nova' expedition. Title is given at one end of the card and "Player's Cigarettes" appears at the opposite end. Verso (typical): 2nd Series of 25. No. [card number] | POLAR EXPLORATION | [Title and Description] | Issued by | JOHN PLAYER & SONS | Branch of the Imperial Tobacco Co. | (of Great Britain & Ireland), Ltd.
1. Capt. Robert Falcon Scott, C.V.O., R.N. The Commander of the British Antarctic Expedition 1910, was born June 6th, 1868 and entered the Navy aged 14; became lieutenant 1889, commander 1900. In 1901 commanded the National Antarctic Expedition. At the end of this expedition he was promoted to captain, and awarded the Commandership of the Royal Victorian Order. In 1910 Capt. Scott organised the most complete scientitifc expedition that ever left for the Polar regions. He, with four companions, reached the Souith Pole on January 18th, 1912, after writing his famous message to the public, which stirred the heart of the whole civilised world. 2. Commander E. R. G. R. Evans, C.B., R.N. Second in Command. Captain of t he Terra Nova on her outrward voyage, but relinquished the command to accompany his leader on the Southern Journey. He was principal surveyor, and piloted the Southern Party to a point only 145 miles from the South Pole. Here he took back the last supporting party, but before doing so gave up one man (Lieut. Bowers) to his leader, in order to make Scott's success more sure. The sacrifice nearly cost him his life. His little party, short-handed, and with little food, fought their way back for 800 miles. Evans was attacked by scurvy, and nearly succumbed. His life was saved under the most tragic circumstances by his heroic companions Lashly and Crean. 3. Capt. L. E. G. Oates, 6th Inniskilling Dragoons. He was in charge of the tranport animals in Capt. Scott's expedition, also served with distinction in the South Africa War, being severely wounded. Oates was one of the men chosen to accompany Capt. Scott to the Pole. On the homeward journey disaster overtook the little band; the most frightful hardships were encountered, and one by one the men broke down. Oates' hands and feet were badly frost-bitten, and realising that he was becoming a drag on the party, this gallant English gentleman nobly walked to his death, hoping by this glorious sacrifice to save his three comrades beset with hardships. 4. Dr. Edward Adrian Wilson, Chief of the Scientific Staff. E. A. Wilson, B.A., M.B. 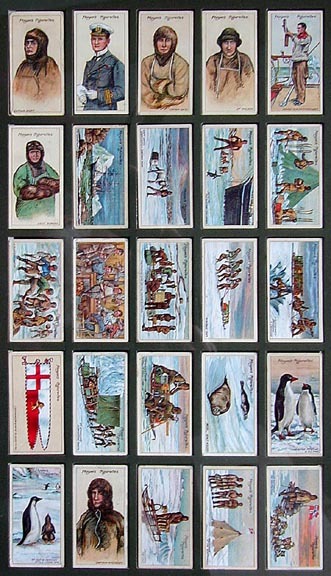 [sic], was artist and zoologist to the National Antarctic Expedition of 1901-4. His sterling qualities made him a friend and companion to Capt. Scott and to all in the expedition. Wilson accompanied Scott and Shackleton to latitude 82° 17' S. This was the farthest South ever reached before the Nimrod expedition. Dr. Wilson was again a volunteer for Polar service in 1910, when he was chosen to organise the scientific staff of the Terra Nova. Wilson was one of the party that reached the South Pole on Jan. 18th, 1912. He died at his leader's side during the long blizzard that caused the tragic lost of the ill-fated Southern Party. 5. Staff-Paymaster Francis Drake, Secretary and Ship's Meteorologist, Taking Sea-Temperatures. The meteorological work is of the utmost importance to navigators. The Wind and Current charts are prepared from the records of observations. In the British Antarctic Expedition meteorological observations were taken simultaneously by the Terra Nova, the main landing party, Lieut. Campbell's party, and also by all detached sledging parties. The whole of this work was correlated and tabulated by Dr. G. C. Simpson, Capt. Scott's chief meteorologist. 6. Lieutenant H. R. Bowers, Royal Indian Marine. This plucky little officier was one of the finest men in the expedition. He was full of energy and grit, besides being the pet and humorist of the little community. Bowers had charge of the stores, and was one of Scott's right-hand men. He was selected to form one of the party that made the final dash for the South Pole. Lieutenant Bowerts perished from exposure and starvation about the 25th of March, 1912. He died bravely at his leader's side, having reached a point only 11 miles from the big depôt at "One Ton Camp." 7. The "Terra Nova" arriving off Cape Evans, Feb. 1911. When Capt. Scott's main landing party had completed the hut and observatories, every available man left Cape Evans with nearly one ton of provisions, to be placed as far South as possible before winter set in, under Scott's own leadership. The Terra Nova proceeded eastward, to land Lieut. Campbell's party in King Edward's Land. Landing was impossible, however, and whilst on their return to report this condition at Cape Evans, those on board the Terra Nova suddenly observed the Fram with the members of the Norwegian Expedition on board. Amundsen announced his intention of making a journey to the South Pole, sacrificing science for speed. 8. Capt. L. E. G. Oates Exercising a Siberian Pony on the Sea-Ice off Cape Evans. During the second half of the winter Capt. Oates was employed training the ponies for the forthcoming Southern journey. He was assisted in this work by as many of those taking part in the forthcoming journey as could be spared from the scientific work. For the training work old sledges with dummy loads were used. Thanks to Capt. Oates' care, by the time the start was made for the Pole, only one of the animals caused him any anxiety. 9. Demetri, the Russian Dog-driver, Keeping a Penguin from the Dogs. When the Terra Nova first reached Cape Evans, several dogs were placed on the ice in readiness for sledging the stores across the frozen sea to the shore. Great trouble was experienced by curious penguins running at the dogs and exciting them; once within reach of the Siberian sledge dogs, the penguin was torn to pieces. Every endeavor was made to keep the stupid birds away, but their curiosity brought them again and again to the dog-teams, and hundreds of the plucky little birds were killed. 10. Unpacking Sledge and Setting up Camp. Scott's men generally marched fifteen miles a day when hauling their own sledges and at the signal to halt the loads would be unstrapped, the tent pitched, and the cook for the day would disappear inside. While the cook prepared the supper the other three men in the team would pile snow and ice on the "valance" of the tent and secure it against a possible blizzard. The sleeping bags would then be passed in, everthing outside would be placed in the best position to avoid snowing up and the tired hungry team would gather in the tent, eat their meal, and turn in. The fur sleeping bags were known as "the friends of man," by a wag amongst the seamen. 11. A Football Match at the Winter Quarters. During the winter Captain Scott used every conceivable means to keep his party fit. The short hour of semi-twilight, about noon, was used for football on the sea-ice. The game was not scientific, but very fast, and it caused boundless amusement to the members of the expedition. The gallant Captain Oates and Surgeon Atkinson were usually chosen to captain the sides. The men always had to play in gloves, the temperatures seldom rising above -30° Fahrenheit, which means 62 degrees of frost. 12. Midwinter Day at Cape Evans in the Men's Quarters. June 22nd, 1911, was set aside by Capt. Scott as a holiday for the members of the expedition. No work was undertaken beyond the routine of cleaning the hut and exercising the ponies. When evening came mysterious boxes were produced, and out of each came presents of tobacco, sweets, and almost forgotten luxuries, for every member of t he party. Splendid cakes were produced from their sealed tin boxes, and even a Christmas tree appeared fully illuminated and decked with toys. The musicians of the party soon turned up, and songs, dances and recitation cheered the little band of Polar comrades. Nobobdy ever looked or felt happier than the bluejackets attached to the enterprise. 13. Preparing one of the Motor Sledges for the Southern Journey. The motor sledges supplied to the expedition were not a success. The motor party, consisting of Day, Lashly, Hooper, and Lieut. Evans, started from Winter Quarters on Oct. 24th, 1911. The party had two motors and six strong sledges, laden with nearly three tons of fuel, provisions, and fodder. By sheer effort on the part of Lieut. Evans' little team, the motors were "persuaded" to a point 50 miles from Cape Evans. Here they broke down irretrievably and had to be abandoned, while the men in charge advanced southward with what they could drag of the loads. 14. A Sledge Team on the King Edward VII Plateau. The final stage of the journey over the great icy wastes leads across a huge snow-capped plateau for over 300 miles. The altitude at which Capt. Scott and his companions travelled reached 11,000 feet above the level of the sea. A cold wind blows contantly from the South, turning one's beard into a solid mass of ice. Day after day, week after week, the explorers plodded on, with nothing to vary the monotony but the glittering ice crystals, which sparkle with a strange beauty when the sun is not hidden by the cirro-stratus cloud that so often obtains in this high Southern latitude. 15. A Sledge Party Crossing a Crevasse. Of all the dangers encountered by Scott and his men the hidden crevasses were probably the greatest; nevertheless, no casulaties were attributable to the existence of these invisible chasms. On the Great Ice Barrier the crevasses were seldom encountered except when close to the land; but on the Beardmore Glacier the sledge parties met with crevasses varying in width from a few inches to several hundred feet. Their depth may have reached many thousands of feet. Frequent instances are recorded of the sudden disappearance of a member of a sledge team into one of these abysses. Happily the harness always held, and the unfortunate man was soon dragged up to safety by his comrades, rudely shaken and bruised, but otherwise unhurt. 16. Commander Evans' Sledge Flag. This little burgee was made of silk, with the St. George's cross at the "head," and the explorer's crest and heraldic colours on the "fly." This flag was carried three times to the South Polar regions by Commander Evans. On the last expedition the flag was left on the Great Ice Barrier, when Evans' party made a depôt of everything not included amongst the bare necessities of life on the occasion of the breakdown of the Commander through the ravages of scurvy. The flag lay in a snow cairn on that glittering ice Barrier for a whole winter, and was recovered by Dr. Atkinson where he was seaching for the lost Polar Party. Commander Evans presented the flag to Mrs. Oates, the mother of the gallant Captain Oates. 17. Dr. Atkinson's Supporting Party. On December 22nd, 1911, the third supporting party (consisting of Cherry Garrard, Wright, and Petty Officer Keohane, under Surgeon E. L. Atkinson, R.N.) left Captain Scott with seven companions in latitude 85° 7' S. This party had assisted their leader up to the top of the magnificent Beardmore Glacier, and now a redistribution of the loads left the four men to return to Cape Evans. This party made splendid progress under Atkinson's skilful leadership. Mr. C. S. Wright, the young Canadian chemist, acted as navigator, and the little band won through and reached the Cape Evans Hut on Jan. 29th, 1912, having completed a march of 1,126 miles, mostly hauling their own sledge. 18. Commander Evans (second in command) Taking Observations. All the surveying and navigating work was carried out by means of specially designed theodolites. These instruments were marvellously accurate, although so light and compact. The explorers were able to fix their position to within a quarter of a mile. In addition to measuring angles and taking sights, a special "trough compass" was fitted, which enabled the magnetic variation to be determined with a fair degree of accuracy. 19. Weddel [sic] Seals Asleep on the Sea-ice. These seals supply all required in the way of fresh meat for an Antarctic Expedition. The flesh in taste is somewhat similar to veal, the liver being a special delicacy. An average full grown seal weighs 700 lbs., and yields quite 2 cwt. of good meat. The hide is of little commercial value, this class of seal being quite different to the little fur-bearing animal. The Weddel Seal feeds on shrimps and fish, and having gorged himself with food he sleeps for days on the ice-floe. 20. An Adélie Penguin and his Mate. These extraoridinary little birds are about 18 inches high; they are only to be found on the shores of the ice-bound Antarctic coasts in summer, i.e. from November to March. The penguins feed on quantities of crustaceans--little pink shrimps with which the sea abounds. They know no fear except from the killer-whales and sea leopards. Once on the ice or on land they are attracted by any unusual object. The little birds waddle and run in a ludicous fashion, and their hoarse squawk of surprise at seeing a man caused the members of the expedition unbounded amusement. 21. An Adélie Penguin with a Young One. The Adélie penguins are the most amusing creatures known to the Antarctic explorer. They settle for the breeding season on the only available beaches fringing the rockbound and ice-covered South Polar continent. Their eggs are laid under the most hazardous circumstances, for the skua-gull hovers above the "rookery" ready to pounce down and fly off with the egg left unguarded for a second. The young penguin is covered with chocolate coloured down, which gradually becomes grey, and finally is shed to give place to the peculiar short black and white tufts which form the penguin's skin. 23. The Norwegian Antarctic Expedition, 1910-1912. Lindström, the Cook. One of the most important members of a Polar expedition is the cook. The health of the party depends so much on the diet and the manner in which food is "dished up" while in winter quarters. Seal-meat tastily served is equal to the best beef, and while partaken of will act most certainly as an efficient preventive of scurvy. This means that with ordinary luck, given a good cook, men will have at the door of their winter hut a tasty antidote to the only disease likely to obtain. But seal-meat badly prepared, with rank blubber left in, will prove a nauseating mess, and no man will willingly partake of it. 24. The Norwegian Antarctic Expedition, 1910-1912. Amundsen at the South Pole. The gallant Norseman, Roald Amundsen, reached the South Pole on December 16th, 1911, with his companions, Hanssen, Wisting, Hassel and Bjaaland. Four of the intrepid explorers are shown in this picture, while the fifth is depicted in No. 25. Floating over the tent is the Norwegian flag, while below is the burgee of the famous ship Fram. The British explorer Scott, was terribly disappointed at being anticipated by the Norwegians, who onnly preceded him by a month; but no decent-minded Englishman grudged the modest man of the Viking breed their well earned prize. 25. The Norwegian Antarctic Expedition, 1910-1912. Oscar Wisting at the South Pole. Amundsen described the arrival at the Pole so simply, so medestly, and yet so vividly, that the English readers of his book, "The South Pole," could have no feelings but those of generous sympathy with the brave and persevering Norwegians. Pride and affection shone in the five pairs of eyes that gazed on the Norwegian flag as it was unfurled and planted at the Pole. Oscar Wisting delighted the whole party by producing presents of pipes and tobacco, It was he who engraved the words "South Pole" on almost every article taken there.